Formerly For Newborns, Plans For Newbuild? Possibly. A former local maternity clinic for sale – with picturesque setting and riverside views, sited within the Loch Lomond and Trossachs National Park. Situated in a traffic free and idyllic spot overlooking the River Teith and within 5 minutes level walking distance of Callander town centre, the former clinic offers an interesting development opportunity. The property which is south facing, currently has Class 2 commercial use (permitted to Class 1). Though it also has significant potential for conversion to a residential dwelling, subject to planning permission. There has already been a planning application granted, but this is currently in a lapsed status. Alternatively Unique Property Bulletin readers have favoured mixed use premises where a house, plus a place to work from home can be created (subject to the ubiquitous planning rules again, and obtaining the relevant agreement for any alternate use). This particular property could well suit that ideal lifestyle – to live and work from a beautiful location with a separate work space, and a commute from home to work in less than 30 seconds. The original planning permission for redevelopment to two residential properties was lodged in 2010 and approved in 2011 (this permission has now time-lapsed and would need renewal). Local authority planning website and permission detail: Click Here. Please note: the original permission, granted on 15th September 2011 had a timeline for commencement of 3 years from that date. Consequently it has now lapsed. There is extensive detail within the weblink provided in this paragraph, and whilst Unique Property Bulletin don’t believe there would be too many obstacles to renewing the permission, readers are advised to study the Loch Lomond & The Trossachs National Park submissions that we have given the link for, and rely on their own due diligence. We are advised that more recently the National Park have indicated their ‘in principle’ support of the plans for a proposed conversion which would see a stunning contemporary property. 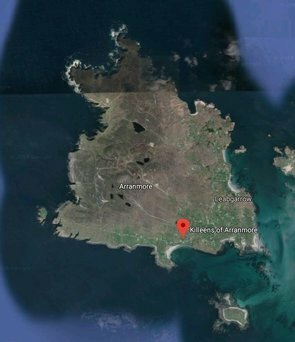 The plans have been specifically designed for the luxury holiday rental market and a national holiday rental agency have confirmed their interest in the marketing and management of the proposed property at a peak rate of some £1000 per week. Regarded as the capital of the National Park, Callander is a popular and busy town with a strong tourist based economy, resulting in high demand in the holiday rental market. 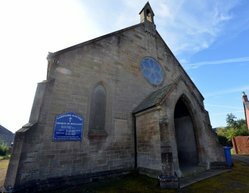 It offers an excellent selection of local shops and restaurants and good communication links to other favoured tourist areas of the Park and to the towns of Dunblane and Stirling. One of the charming aspects of this former maternity clinic is that it was utilised by the local nurse in the town to meet with the new mums, weigh babies, give vaccinations etc. There are a good few people still living in Callander who have spent some time in the Clinic in their younger days! Although it has not been used, as a clinic for at least 10 years. Given its picturesque riverside and traffic free location it is an ideal renovation project, particularly as a holiday home. And particularly as a holiday home for keen anglers as immediately outside the property is the “Black Hole”, this is a famous fishing pool of the Teith, a hidden gem of the fishing world. See the mentions of Black Pool here.. Location: The Clinic, South Church Street, Callander, FK17 8BN. Further Details: The Clinic – Click Here. Please can you advise the estate agent that you found this building via Unique Property Bulletin. This helps us to keep this website as a free resource for you to use. The photograph above shows 420 year old craftsmanship at the 3 bedroom, 3 storey Tudor House in Tewkesbury for sale. Guided at £175,000. To find out more about this building plot, please CLICK ON THE PHOTO ABOVE. FOR SALE: Building Plot For Sale £44,500. Your Own Unique Home Design? Already Has Outline Planning Permission. Detached House in the Capital. 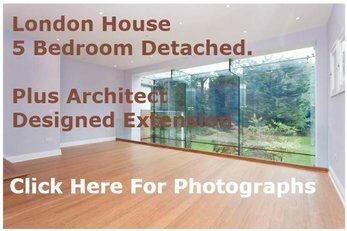 Includes architect designed extension. To read the online details and also see further photographs, please CLICK ON THE PHOTOGRAPH ABOVE. On Anglesey Island is this handsome Coaching Inn and a large Stable Block for auction. Guided at £315,000. To read the online details and also see further photographs, please CLICK ON THE PHOTOGRAPH ABOVE AND SCROLL DOWN THE PAGE. NOW SOLD - MORE LIKE THIS NEEDED - Do you have one for sale and would like to get it sold? Just send us an email, we can help you sell it. ARCHIVED details for reference - Please click on the photo above to read more. NOW SOLD. To read ARCHIVED details about the former Lighthouse Keepers' Cottages at Douglas on the Isle of Man, please CLICK ON THE PHOTO ABOVE. REGULAR MID-EDITION BULLETIN UPDATES.. Our new UniqueBulletin Twitter account aims to have mini-update posts every DAY OR TWO - in between the main and full MONTHLY edition. Please CLICK ON THE PHOTO ABOVE BULLETIN to read more. Maybe worth also clicking on the Twitter page "Follow" button for extra alerts. ROC Nuclear Bunker NOW SOLD: UKWMO Brundall East of Cuckoo Lane, Brundall, Norwich, Norfolk NR13 4JA. PLEASE CLICK ON THE PHOTO ABOVE for archived details and background information. 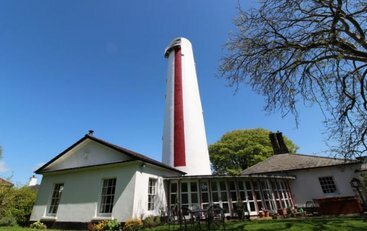 NOW SOLD: Converted Lighthouse Engine Room. NOW SOLD - To read about the earlier featured details of this house converted from a former Engine Room within the original Lighthouse Complex at Strathy Point PLEASE CLICK ON THE PHOTO ABOVE. This UKWMO Underground Nuclear Bunker that we had for sale is now sold. We have 30,000 readers, several dozen of whom have emailed asking to buy more of these underground bunkers. if you have one of these amazing spaces for sale, please CLICK ON THE PHOTO ABOVE to read more. Also please consider registering with Unique Property Bulletin for an EMAIL ALERT should we have further UKWMO stations coming up for sale. Our regular Sunday night Unique Property Bulletin online version is totally free for anyone to use. We hope you enjoy the content and find it useful. If so, it would be a nice thing for you to give some feedback, or even consider helping with the administrative costs of site upkeep by buying our Unique Property Manual, or one, possibly more of our Special Article Features: just click SPARTS on the horizontal menu bar above. This not only assists us paying the site hosting and broadband bills, but may even help you in your own effort to find that deal and unusual home. Kind regards. 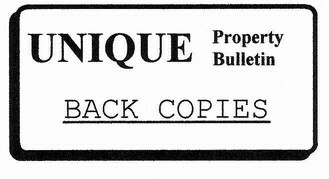 Copyright - 1987 to 2016 Inclusive: Unless otherwise attributed, all material, including photographs in all Unique Property Bulletins is protected by copyright. As such the content within this website may NOT be reproduced without the courtesy of prior written permission. Thankyou. The Unique Property Bulletin is usually published online at around 9pm first Sunday of each month. Our aim is to provide readers with a variety of unusual places to buy or rent. 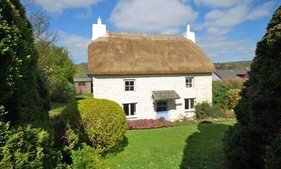 We list over 400 unique properties per annum. This website is free to read. It is run on a not-for-profit basis by volunteers.